On a busy road in the northeast of Hanoi’s old city, you really need to know where Gấu Coffee Roasters is, although if you look in the window, you’ll probably be drawn in, particularly if you see the roaster all the way at the back of the long, thin store. All the coffee’s roasted here, with a range of origins, plus home-grown Vietnamese Arabica. There’s a blend on espresso, with multiple single-origins on pour-over through a variety of methods, plus traditional Vietnamese coffee. When I visited just over a year ago, Gấu Coffee Roasters had only been open four months. Since then, there’s been considerable expansion, with a second store, including a bakery, opening, while at the original store, the upstairs, which was a work-in-progress when I was there, has also opened. The store itself is on the busy Hàng Bè, an extension of the street which runs north from the eastern shore of the lake in the heart of the old city. If you’re struggling to find it, it’s right on the T-junction with Chợ Hàng Bè, facing that street. It’s a modest spot, sandwiched in a row of taller buildings, a simple white, two-storey structure. On the ground floor, set back a little from the pavement, the front consists a single, massive, square window, with a glass door inset on the right, while upstairs, a deep balcony is visible. Inside the layout matches the simplicity of the exterior. With high ceilings (it’s as tall as it is wide), Gấu Coffee Roasters goes a long way back, maybe four or five times as long as it is wide. The counter, on the left-hand side, occupies most of the space. Set back a little from the window, there’s space for two bar-stools at the front by the grinders, while another five bar stools line the side of the counter, one at the front by the La Marzocco Linea espresso machine, and another four towards the back, where you can watch the pour-over being made. Finally, in the back, there’s the 5kg roaster on the right and the stairs on the left. These lead to a similar-sized, long, thin upstairs space which was being fitted out while I was there, which meant I missed the opening by a couple of weeks. This will provide an additional 20 seats, plus access to the balcony which I suspect will prove popular, although the air-conditioned interior, with its high ceilings, has its attractions. During my visit, there was a house-blend on espresso, made with beans from Panama, Ethiopia and Vietnam. A separate page on the menu listed the single-origins on offer, five of them during my visit, with detailed tasting notes and maps showing the farms/regions. I would have loved to have lingered and tried more of the coffee, but sadly I had to catch my flight. Instead I played it simple, going for an espresso. This was a beautifully-pulled shot, amazingly well-balanced and bursting with flavour. Fittingly, for my final coffee of the trip, it was probably also the best. 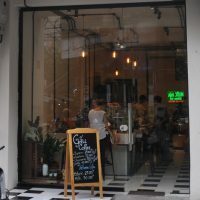 This entry was posted in Cafe/Roaster, Coffee Shops, Evening Opening, Hanoi, Laptop Friendly, Late Opening, Roastery, Saturday Short and tagged include by Brian Williams. Bookmark the permalink.